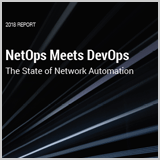 In a survey co-sponsored by F5 and Red Hat, more than 400 IT DevOps and NetOps professionals provided insights about the current and future states of network automation. The findings reveal opportunities where NetOps teams can learn from DevOps best practices, integrate with continuous deployment toolchains, and take advantage of modern, open source automation technologies to create a more agile, business-centric approach to building networks. IDC's global study assessing how IT and automation strategies are evolving due to cloud computing, DevOps and digital transformation initiatives.